Q) What is the Museum's mission? A) The Montana Museum of Art & Culture acquires and preserves art that expresses the spirit of the American West and its relationship to the larger world. As a university and state museum, MMAC presents exhibitions and educational programs that explore local, regional and global themes. MMAC exhibitions focus on Montana art, contemporary and historic art of North America and Europe, contemporary Native American art, Asian art, and works from the Permanent Collection. The Permanent Collection, begun in 1894, now includes more than 11,000 original works, one of the largest and oldest collections in Montana and the Rocky Mountain Northwest. Q) How much does it cost to visit the Museum? A) The Montana Museum of Art & Culture asks for a $5 suggested donation at the door to help cover exhibition and collection expenses. Q) How do you get to the Museum? A) The Montana Museum of Art & Culture's Meloy and Paxson galleries are located on The University of Montana campus in the Performance Arts Radio Television Center (known as the PARTV Center) building across from the Adams Center off of E. 6th Street. The galleries are located off the main lobby. The Museum offices are located in the basement of the Main Hall in room 006. Main Hall is located between the Mansfield Library and the University Center, and has a large clock tower. 1) Take Missoula's first exit onto Van Buren Street, turn left at the stop sign and merge into the right lane. 2) At the stoplight, turn right onto Broadway Street. 3) Move into the furthest left lane, and turn left onto Madison at the first stoplight. 4) Driving over the bridge, stay in the left lane, and veer left at the fork in the road. After the fork, keep to the left and turn left onto 6th Street at the stoplight. After making a left on 6th Street, get into the right lane. You will be heading due east and directly in front of you will be the Adams Center. You are now on campus. 1) Take Missoula's last exit onto Van Buren Street, Exit 105, turn right at the stop sign and merge into the right lane. 2) Follow steps 2-4 from above. Q) Where is Museum parking located? A) Limited free parking is available near the northeast corner of the PARTV Center. All-day UM parking passes can be purchased at the galleries, Public Safety in the Physical Plant Building 32, The Source in the University Center, and other outlets for just $3 per day. Free UM Park-n-Ride buses stop near PARTV. Hourly parking is available east of the University Center. Other University parking is free on weekdays after 5 p.m., weekends, and University-observed holidays. Quick-Stop parking is located on most lots, is marked by orange signage and limit parking to 20 minutes. Q) Is the Museum accessible for people with disabilities? A) The south entrance to the Performing Arts Radio Television Center is ground level with automatic doors for easy wheelchair access. Accessible bathroom facilities are located inside the building, and limited accessible parking is also available on the north and south entrance parking lots. For more information, please visit our accessibility page. Q) How do I donate artwork to the Museum's Permanent Collection? A) Potential donors submit photos and basic information about the artwork such as dimensions, name of artist, medium, date artwork was created, etc., to be reviewed by the Museum's Collection Management Committee. Upon acceptance of artwork, Deed of Gift is mailed to the donor. Contact the office at 406.243.2019 for more details. Q) How can I help the Montana Museum of Art & Culture grow? 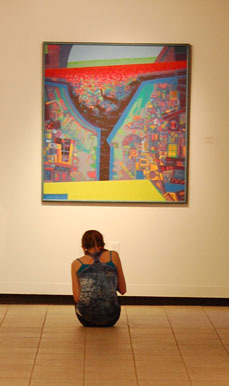 A) Maintenance of the Museum's Permanent Collection and programs depend upon financial contributions from the public, alumni and benefactors of the University. Contact the office for more details. Q) How can I become a volunteer or intern at the Museum? A) Volunteering or interning at the Museum offers community members and university students a wonderful opportunity to get involved and learn about art, how a museum runs and much more. Internships are offered through the School of Art and other UM schools and are offered on a semester basis. Credits will be given upon successful completion of hours agreed to by advisors and museum staff. Available internships include Curatorial Assistant or Exhibition Production Assistant. Volunteers may be asked to help with various activities during art events such as openings and tours, provide clerical and receptionist duties during office hours, monitor the galleries, assist with cataloging, and provide assistance for installation and de-installation of exhibitions. Volunteers are encouraged to sign up through the Museum offices located in the Main Hall room 006. Contact the office at (406) 243-2019 for more details. Q) Does the Montana Museum of Art & Culture provide appraisals? A) University policy prohibits the Museum from offering appraisal and art consulting services. The Museum can provide referrals to outside appraisal services in the area. Please contact the Museum staff at (406) 243-2019 for more information and referrals. Q) I would like to bring a group to tour the Museum. How can I arrange it and what does it cost? A) Guided group tours are free and can be arranged in advance through the Museum office. We strongly encourage groups to schedule tours during normal open hours, but docent tours can occasionally be arranged outside normal museum hours if necessary. Please arrange tours at least a week in advance by calling the Museum staff at (406) 243-2019. Q) Does the Museum have a gift shop? A) Although there is no official gift shop at the Museum galleries, several publications are available for purchase at the Galleries or on our website. Also available are art cubes featuring images from the Permanent Collection.